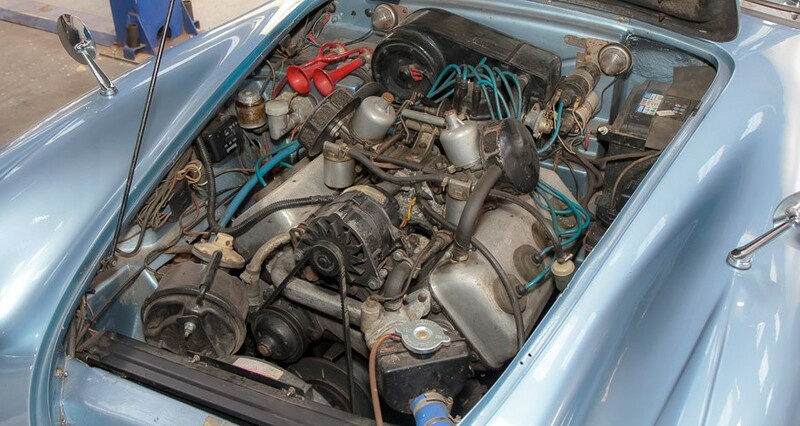 A 1962 Daimler Dart (2.5L V8) came to us with a really nasty, serious engine vibration which made over 3,900 rpm unusable, it should have sung beautifully to it’s 6,000 power peak of course. The previous owner had replaced the clutch and we soon surmised, the flywheel… a component normally balanced with the crankshaft and front damper as an assembled unit. The engine was therefore hideously and fundamentally out of balance and the poor owner was facing big engine out, balance and re-build costs running well into £3,000+ territory. Fortunately we know a thing or two about engine balance and cured the fault completely for an afternoon’s labour plus £9.31 of weights! Understanding the route by which the problem came about and via a hole made in the bell housing giving access to the clutch/flywheel bolts, we laboriously added/subtracted weights to the bolts by trial and error. This progressively corrected the fault at source until it became a silky smooth running V8 once more; then we locked everything into place. The owner could scarcely believe his good luck and now visits peak revs frequently for the full aural ‘hit’!